Embedded telephone recorder is non pc based telephone voice recording system which does not require PC to save recorded voice files. We provide various ranges of embedded voice logger syste, having inbuilt SD card to record voice files. The system also called as standalone system. The system is user friendly, easy to use and plug and play connectivity with rich features. Aria Telecom is global leading and well known name in the field of providing embedded voice recording system. We offer 4 port embedded voice logger system with SD card to save voice files. The system does not require computer to record calls and works faster than other voice loggers. 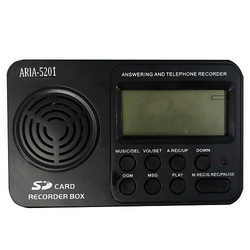 Aria Telecom offers wide range of non pc based telephone voice recording system in Delhi NCR. AR 800 is 8 port embedded telephone voice logger with SD card to save voice files. The system is capable of record single telephone line (analog & digital) with answering machine. AR 5201 is Single Line Embedded Telephone Recorder with answering machine. The system appreciated by our clients due to their ease of installation. secure database system and no PC required.